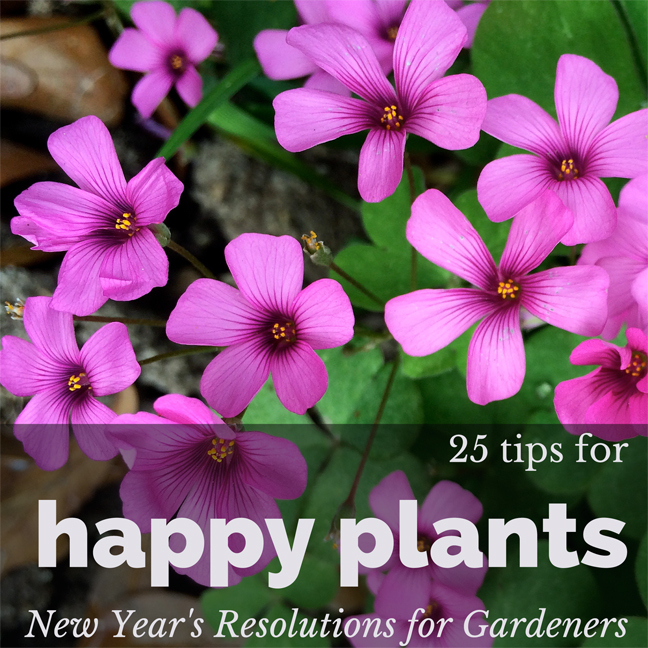 Many of us will be planning New Year’s resolutions: to live 2015 happy with who we are – happy that we’re not all the same, perhaps – but our plants can’t make resolutions and are dependent on us for at least some of their happiness. How do we make 2015 a happier year for them? When buying plants, resolve to buy happy ones! Only buy from speciality growers or from garden centres where all the plants are well cared for, all year round. By all means, cheer up a neglected plant in the bargain section by giving it a new home and providing proper care. But when plants are offered at full price, resolve only to buy those that are flourishing. Easy-going plants are more likely to be happy in your garden. There are many different forms (technically, cultivars) of plants. They don’t all perform equally well. Weed out the finicky ones by asking suppliers to recommend the easiest to grow. Research whether plants you crave will be happy with the conditions in your garden and resolve only to grow plants that will. If crepe myrtles won’t thrive and lilacs will, grow lilacs! Choose the best place you can find for new plants. Many plants are happiest in a sunny, south-facing garden. Before you plant in partial or full shade, resolve to make sure that the variety will enjoy it. Mentally check the access to nutrients and rain before planting anything in 2015. Is the soil decent? If not enrich it. Will your overhanging roof prevent them from getting water? Fine if they’re drought tolerant plants or you’re able and willing to water regularly. If not, choose another spot. Give plants space when planting, and resolve to keep an eye on them: that way you’ll appreciate them more. Watch out for any plants that start to bully companions, smothering them or stealing all their water and food. Be prepared to dig some of them up and move them as soon as they start to crowd each other out. If you plant in containers, resolve to make them generously sized ones or construct a raised bed. Plants facing double jeopardy (or worse) have real problems ahead. They’re likely to just survive rather than become happy, fulfilled specimens. Shrub roses can tolerate some shade, but a small container + poor soil + partial shade + erratic watering = a sorrowful rose. Resolve not to push your luck too far: remember it’s the plant that will suffer if you do. If you have a plant that is ailing in a poor spot or conditions that clearly don’t suit it, resolve to move it as soon as you can and give it another chance. Plan ahead and plant with the natural seasons: this means in spring or autumn for most plants. Resolve to try harder to avoid the temptation to plant shrubs or perennials when they catch your eye in full flower at the height of summer. Be generous to your plant when preparing its new home. Always plant in a decent size hole (2-3 times the width of the plant). Dig the soil over well before planting, and enrich it by adding plenty of organic material. Don’t be afraid to choose the cheaper option: bare rooted plants will do just as well as more expensive, potted ones. If a containerised rose or shrub is freshly potted, most of the soil may fall off anyway when you come to plant it. Don’t worry about this, but do take care not to damage any new, white, sensitive roots. Plants that are ‘pot bound’ have old roots wound tightly round and round inside the pot and need urgent help to change their spiralling mindset. If you have a plant like that, gently tease out the roots as much as you can and loosen off the old soil before replanting. Plants like consistency: they will settle in after replanting better if you position them so that the soil is at the same level as it was before. Parts that have been below the soil tend to be darker. Plant bulbs at a depth of two to three times their own height. Always water well after planting. Resolve to learn the art of watering or at least to think more about it. Apply a thick blanket of mulch and resolve to top it up as the worms gradually drag it under. Mulching increases plant happiness – it helps keep them weed free and conserves their water by preventing evaporation. Most plants don’t need much to be happy. They might not be able to tell you what they need but their ‘body language’ will give you hints. Resolve you’ll learn to speak plant in 2015. It’s not as hard as you might think! Don’t expect all plants to have the same habits: just like people, different varieties of plants will tend to be shaped – and hold themselves – differently. Each to its own – if your plant has beautiful, lush foliage, is spreading outwards or upwards and is flowering or fruiting well, it’s happy. An unhappy plant often looks that way. They rarely keep their problems secret. If the plant looks dried out and droopy, as if it’s fainting, you probably need to water it. But you can make plants unhappy by watering them too much just as easily as too little. Both eventually kill the root tips: drought dries them and shrivels them up; over watering rots them. Lifting the pot will give you a clue: if it’s heavier that you’d expect, it’s wet; if it’s light, it’s dry. If you’d be happy to have a really large fast food meal once a year, by all means do the same for your plants. If not, resolve to feed your plants twice a year with an organic-based slow release fertiliser. If a plant is unhappy despite your best efforts, resolve to ask for help from the experts. An online search for the plant’s symptoms (eg ‘Rose leaves have gone yellow’) will often lead you to advice about what action to take. Many nurseries have a presence on Twitter, Facebook and blogs and are happy to answer questions. Find a local garden centre for soil and supplies that will give you advice and build a relationship with them. Many new plants are guaranteed to grow. Ask for advice – or a healthy replacement – from the people who sold you the plant. If you’ve purchased your plant from a caring company, they’ll want you to have a great experience growing your new plant. Resolve to give them a chance to set things right. Just as human beings need to wrap up well on cold winter days, tender plants need winter protection. Keep them happy by covering them with a plant blanket or cloche, removing the protection when the sun heats up, or move them inside. Don’t worry if they shed their leaves when brought inside – it’s natural. New ones will soon appear. If your plants have been frozen solid, it’s easy to assume you can leave them to their own devices after the thaw. But plants can’t drink from frozen ground, so they might be parched and need watering after a long freeze, even if this seems counterintuitive. By reading the plant’s body language and digging down a little to test the soil around the plant, you’ll usually be able to work out whether to water it. Plants are living things with strong natural instincts that help them survive and reproduce. Most of them don’t need mollycoddling. Some naturally have a short lifespan: others will give you pleasure for years. And you have instincts too: resolve to trust them more. Your garden doesn’t have to be large, famous or like everyone else’s garden – and expect it to change, grow and ebb, as all things do. I hope that for 2015, you’ll resolve to make your garden a space where plants can be more happy: it’s a sure fire way for you to find more happiness too. I enjoyed reading! You have a great comprehensive article here. I hope to get my garden up and going and happy in 2015! Thank you – wishing you and your garden a very happy 2015!